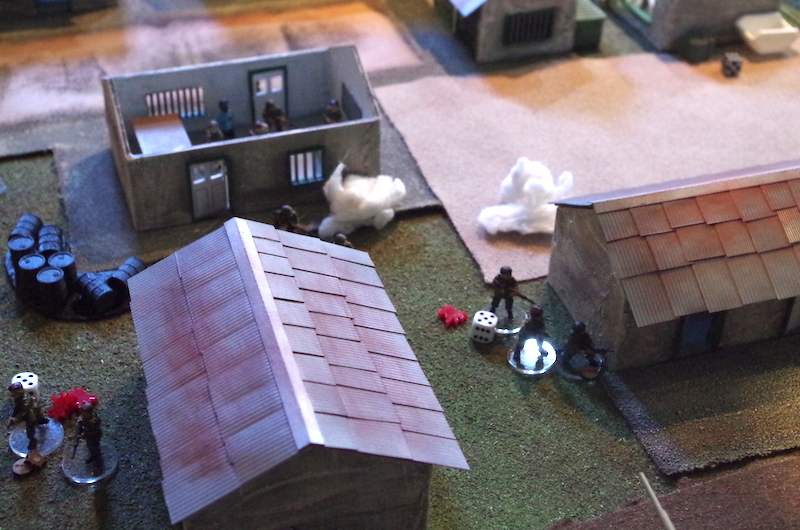 Combat Patrol Gaming in Rippon | H.A.W.K.S. 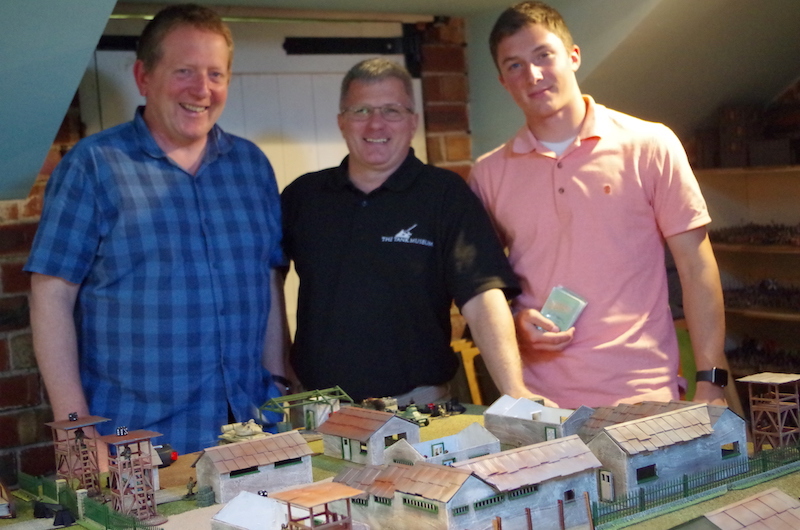 While in England, I took the chance to travel to Yorkshire and visit Chris Alley of Sally 4th for a Combat Patrol™ game in Rippon. Chris has a really nice games room. We played Combat Patrol™, had an excellent dinner with Chris and his wife, and then played some Settlers of Cataan. 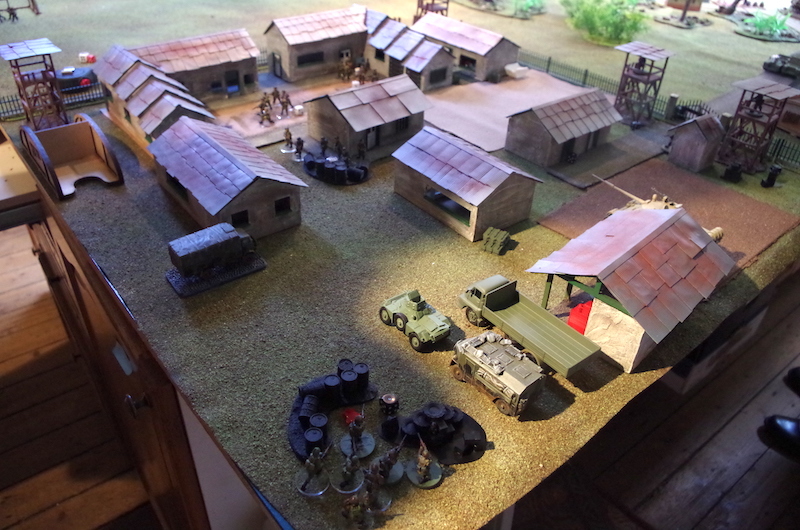 Chris is working on terrain and scenarios for “The Other Partizan,” an upcoming wargaming show in the U.K. The game was based on the movie The Wild Geese. Chris has the mercenaries and simbas all painted up, and the African-style buildings will be part of a future Sally 4th Kickstarter. In this scenario I was the wild geese, I had released President Limbarny from prison, and I needed to escape. To accomplish my objective, I needed to secure enough transport to take Limbarny and my team off the table. Limbarny moved as Green because of his reduced physical state, which slowed me down. The defenders were in several of the buildings, the recreation room, barracks, and guard room. The guards at the gate were awake and active, as were the Simbas in the bottom left of the picture. The sections in the barracks and recreation room each had a morale marker that had to be worked off before they could begin to respond. In the previous play test of this scenario, Chris set the Accuracy of the mercenaries as Elite, and he thought that overpowered the mercenaries. In this play test, my wild geese had an Accuracy of Regular. My Melee was 0 to reflect the fact that the wild geese were somewhat older and not in their prime and that the Simbas, with Melee of 1, were in good shape. The Simbas, however, had Guts of Green for their troopers and Regular for their leaders. This meant that if their leaders were alive, they used the Guts of Regular for activation and movement, but if the leader was killed they would have Guts of Green for activation and movement. Outside the camp, I had two teams in land rovers coming to reinforce my mercenaries. One land rover contained a bazooka team, and the other a Vickers machine-gun team. As the guards at the gate were active, I elected to halt, dismount the machine-gun, and fire on the gate guards. Tom engaged my land rovers with fire, killing a member of the machine-gun team and wounding another. 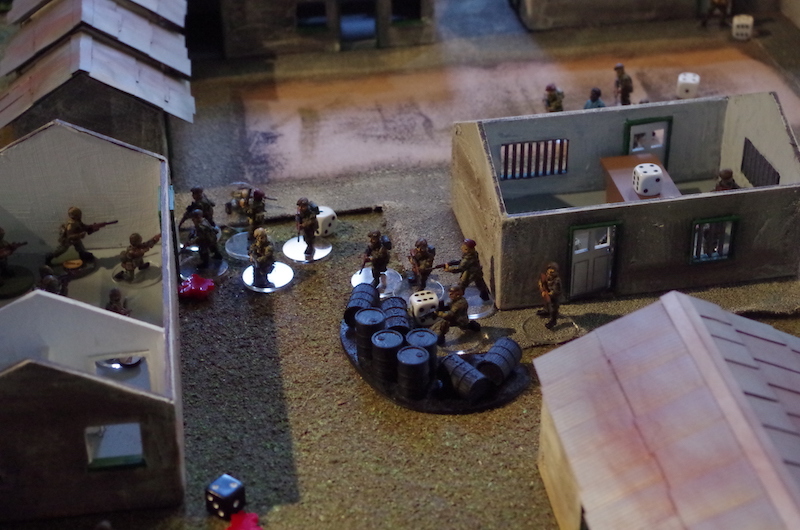 The bazooka team fired several shots at the gate defenders and also the Simbas in the recreation room. I was very lucky with the bazooka. I never received an out-of-ammunition results, so I was able to fire several shots. Tom reduced my machine-gun team by killing an ammunition bearer and assistant gunner. He even knocked out the assistant gunner for the bazooka, but he never knocked out either team. I had two sections move toward the truck park while the third section moved President Limbarny to the relative safety of the headquarters building. One section advanced into the barracks and was surprised to run into a section of active and awake Simbas. This is when I learned that my wild geese had a poor Melee attribute. I lost a soldier and was pushed out of the building. The team then spent several turns being gunned down in the open by Tom’s Simbas before they could respond or seek cover. The section near the 55-gallon drums advanced toward the truck park. As they advanced, they were surprised in the open by the Simba motor transport operators. That section also was gunned down in the open before reaching the trucks. My headquarters section that began the game in the Simba headquarters moved to come up behind the Simbas at the gate, but Tom’s marksmanship was just too good. 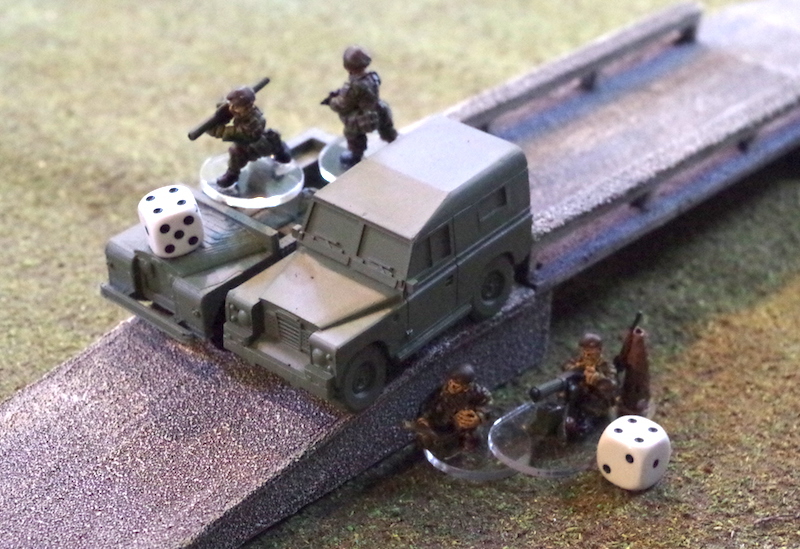 Though this attack diverted the attention of some of the gate guards and those in the towers from my machine-gun and bazooka teams, it was just not enough force to clear a path for the land rovers. By then, Tom and knocked out one of the land rovers with small arms fire. At this point, Chris jokingly pointed out that my heavy casualty rate meant that I didn’t need as many trucks to extract what was left of my team! At this point, we determined that I no longer had enough combat power to accomplish my objectives. It was a convincing Simba victory. Despite Tom’s lopsided victory, it was a fun scenario with lots of interesting decisions for both players. I suggested to Chris before he runs this at Partizan that he might want to give the wild geese a couple of blue cards in the Activation Decks to give them an initiative advantage.